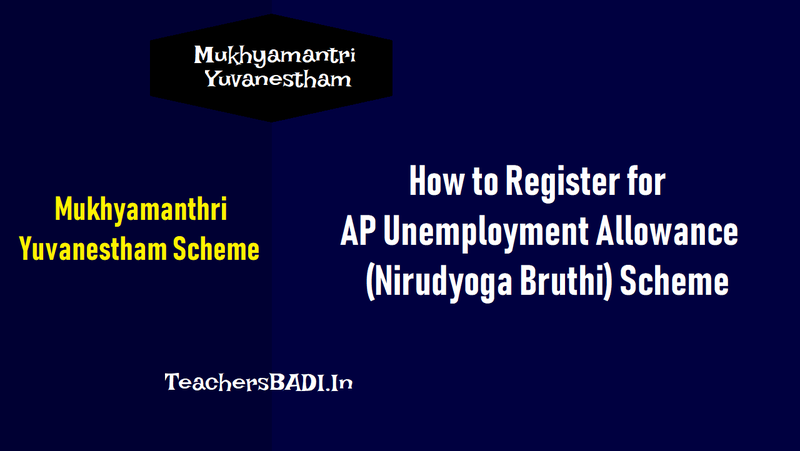 How to Register for AP Unemployment Allowance (Nirudyoga Bruthi) Scheme 2018: AP Mukhyamantri Yuva nestham Scheme Online Registrations, AP Nirudyoga Bruthi Registrations, Chief Minister Yuvanestham Scheme in AP for Unemployment, Nirudyoga Bruthi AP Online registrations, Nirudyoga bruthi Last date, Nirudyoga Bruthi Apply online, AP Nirudyoga Bruthi apply online, Yuvanestham registrations, Yuva nestam registrations, www.ap.gov.in nirudyoga bruthi. The AP State has finalised the list of eligible beneficiaries of the much-awaited Chief Minister Yuva Nestham unemployment allowance scheme, which will be implemented from October 2. The website to enable the unemployed youth to register for the scheme will be launched on September 14. In addition to diploma and degree holders, the Govt also decided to extend the benefit to the youth with D Pharmacy qualification. Similarly, the youth who are already availing of social security pension, will also be eligible for getting the dole (benefit paid by the government to the unemployed). 1. What are the eligibilities require to get this scheme? 2. To be enrolled in Praja Sadhikara Survey(PSS). 9. Age between 22 and 35 . 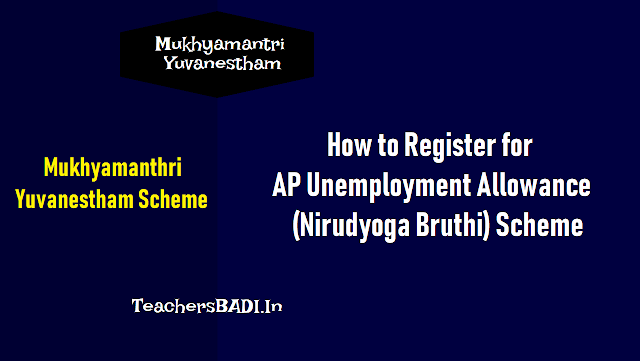 ✓To apply Yuvanestham scheme, click on “APPLY NOW/LOGIN” button. ✓To know about mobile number linked with aadhaar number, Then click on “Click Here” button. ✓Enter aadhaar number, Security code and click on “Verify” button. ✓Enter unemployed Aadhaar number, and click on “SEND OTP” button, OTP will be sent to Aadhaar linked mobile number. ✓Enter received OTP and click on “VERIFY OTP(Note : Resend OTP will be enabled after 1 minute)” button after successful verification of OTP page redirects to personal details page. ✓This page displayed with your personal details. If you want to change your address details then click on edit button and update your address details. ✓If you want to change your Mobile number then click on “edit” button window will be displayed. ✓Enter mobile number and click on “Send OTP” button, OTP will be sent to entered mobile number. ✓Enter received OTP and click on “Verify OTP” button. Your mobile number successfully updated. ✓After successful updating of mobile number enter E-Mail ID(Optional)click on “APPLY /CONTINUE” button. Your eligibility criteria with status will be displayed. ✓Your bank Aadhaar mapping status will be displayed. ✓If you are not eligible remarks with description will be displayed. Eligible criteria will be shown as tick mark, Not eligible criteria will be shown as cross mark. ✓ This module will appear when your aadhaar number not seeded with registration number. ✓ Enter hall ticket number and click on “Get education details” button your education details, personal details will be displayed. ✓ Choose certificate and click on “Upload” button, Your certificate successfully uploaded. Click on declaration checkbox and click on “Agree” button data uploaded successfully and submission of application module will be populated. ✓Select one grievance and enter all fields and click on “SUBMIT” button. Your grievance raised successfully. ✓Click “NO” stay in same screen, Click on “Yes” you are successfully opt out from the scheme. ✓You are successfully opt out from the scheme and Yuvanestham ID successfully generated and page redirects to “My Profile” screen. ✓Click on “Educational details " button your educational details will be displayed. ✓If you want to add more education details, Then fill all mandatory fields and click on “ADD” button. Your education details added successfully. ✓Click on “Areas of interest" button details will be displayed. Select type job placement or self employee and select any 3 area of interest and click on “SUBMIT” button data submitted successfully. ✓Click on “Trainings attended" button details will be displayed. ✓Click on “Payment transaction" button details will be displayed. ✓Click on “Grievance details" button details will be displayed. ✓Click on “Preview” button, Preview page will be displayed. ✓If you want to logout from the application then click on “LOGOUT” button. I didn't get my unemployment fund of December month. May I know the reason and do some favor on my issue. Thanks in advance.